Your students will master the rules of English grammar, build vocabulary, and achieve academic language proficiency! 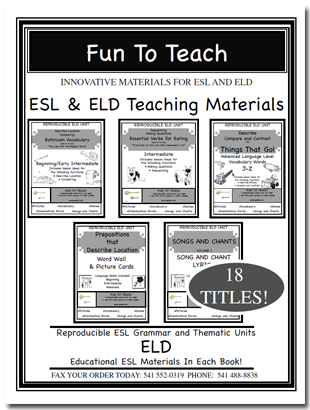 Educational ESL/ELD Materials In Each Book! Ideal materials to assist in teaching English Language Development. Explicit instruction in the rules of grammar! Make your lesson planning easier with units which contain quick and easy plans and activities to stimulate and engage ESL students.